Yet another song so aptly applies to life – probably how it is meant when songs are written, but it does seem so cliche sometimes. I remember when I was in high school and college and I posted song lyrics as instant messenger away messages and in my profile – they usually were silly love songs based on who I was crushing on at that moment. So many things in life seem silly when we look back on it years later. Recently, I was reading through old journal entries to see what I was writing around some particularly challenging times as a teen. Those were interesting enough, but what stopped and made me laugh were all the hours I spent going on and on about boys – oh my gosh, what a wasted effort that seems now, haha. I know all girls go through it, and it’s a part of growing up, but it’s just really interesting to see what took up my energy and emotions back then compared to now – and how dramatic I thought things really were. Crush after crush, conversation after conversation analyzed – nothing compared to paying rent, performing in your job, working through a three-year long distance relationship, and all the other things that come along when you become an adult. This past week, I was able to step out of life for a few days when I returned home to Ohio. Although I’m almost 25 now, going home makes me feel like a teenager again. Not because I’m grounded or have bedtimes or can’t drink wine with my parents, but because I feel protected by them again, because I get to ride in the backseat again, because they pay for my movie tickets, go to Dewey’s and Graeter’s with them, and Dad makes me pancakes and coffee. This week, Dad got Mom a Wii for her birthday, and playing games with them felt like the old days of Mouse Trap and goofing around in the backyard. And of course, we made the beloved trip to Barnes & Noble to kill some time before dinner – one of my favorite excursions. 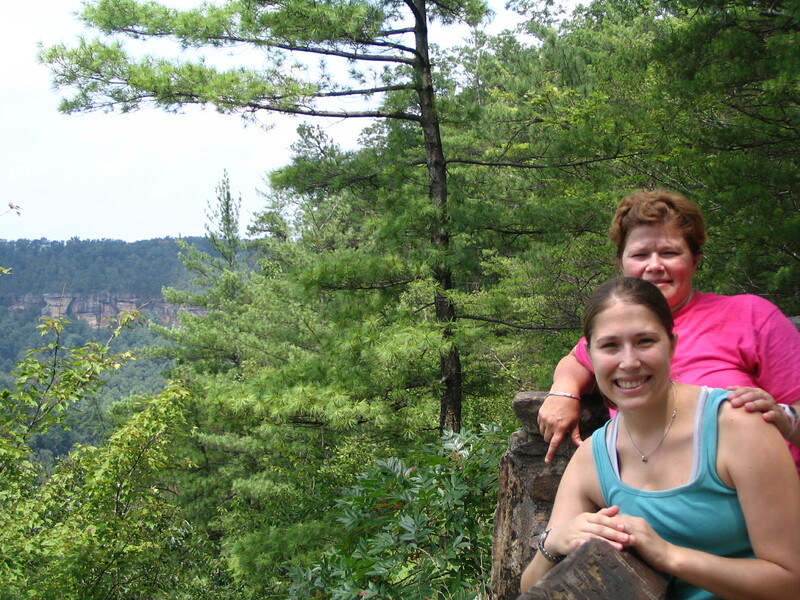 Part of the week was spent hiking in the Daniel Boone National Forest & Red River Gorge with Mom. After the first day’s hike, we spent the evening on the cabin’s porch swing, drinking beer and remiscing about the old days with her family, and yearning for some good homecooked Cajun food. The next day’s hike was chattier than the first, as I peppered her with questions about some of those abovementioned “challenging” times in my life. I apologized for the hard questions, but she answered what she could, and I really felt that it was necessary to talk about some of those things in conjunction with what I’m working through now. There are so many things that I don’t remember how it went, or why something happened, and I’m at that point where I want to know more, to help me move on. Today, I came back to DC and back to life. It was cleaning, grocery shopping, and tomorrow is work. Tomorrow is reality- the adult stuff that has to be done. I thank my parents for giving me this week with them to be a kid again, and to forget about the realities of adulthood for just a little while.